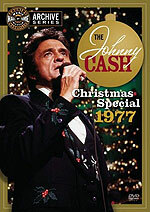 DVD reviews: "The Johnny Cash Christmas Special: 1976" and "The Johnny Cash Christmas Special: 1977"
These reviews first appeared in Turbula in December 2007. These two holiday TV specials from the late 1970s featured an already-famous, on the verge of legendary icon status Johnny Cash. He was a familiar presence to television viewers of the time, having hosted his own weekly variety show on ABC from 1969 to '71. And so there's an ease and sense of comfort that permeates both of these hour-long specials, recently issued on DVD. Music performance is the heart of both specials, with Cash joining his guests on a variety of songs, both holiday-themed and not. There aren't any skits or much in the way of dialogue, outside of Johnny or his guests introducing the next song. When Johnny Cash hosted a holiday special, it was about the music. The 1976 edition is a bit on the cornball side of things, with Tony Orlando as Johnny's main guest at both his Tennessee farm and his large home. Rather than a stripped-down performance of his mega-hit, "Tie a Yellow Ribbon Round the Ole Oak Tree," the producers introduce a string section while Cash, Orlando and Cash's wife, June Carter Cash, are ostensibly walking through the woods singing. A set of four songs performed with country star Roy Clark work better, due to the more minimalist arrangements. 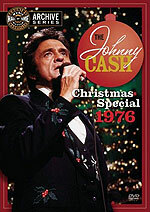 The highlight of the '76 special is a duet Johnny performs with his brother, Tommy Cash, "That Christmasy Feeling." Looking and sounding remarkably like his more famous sibling, Tommy's performances is mesmerizing. Likewise compelling is a pedal steel guitar workout by Barbara Mandrell, more famous for her string of hits as a singer but nevertheless a powerhouse pedal steel player. The show closes out with the Rev. Billy Graham narrating a Christmas story. For the 1977 show, the locale is moved from Cash's farm and house to the Grand Ole Opry House in Nashville. Roy Clark is back, but the Stater Brothers replace Tony Orlando  and fellow Sun Records rockabilly pioneers Roy Orbison, Jerry Lee Lewis and Carl Perkins also sit in as part of a tribute to their recently deceased co-hort, Elvis Presley. While those performances  "Blue Suede Shows," "Oh, Pretty Woman" and "Whole Lot of Shakin' Going On"  are riveting, the highlight is probably a three-song tribute to Gene Autry by Johnny and Clark, giving lovely renditions of his three children's Christmas hits: "Here Comes Santa Claus," ""Frosty the Snow Man" and "Rudolph the Red-Nosed Reindeer."